The first round match between Bubba Watson and Kevin Na at the WGC Match play was a bit of a seesaw ride: Bubba led by two after 12 holes, Na won the next three to go ahead one, and then Bubba squared the match on 16 with a birdie. It remained tied going into the final hole, a 361-yard par 4 that appeared to favour Bubba considerably given his length off the tee. As expected, Na laid up and Bubba went for the green, smacking a 346-yard drive that found the left greenside bunker. But things went immediately sideways for the 2-time Masters champion from there, beginning on his first bunker shot when he appeared to lose his balance during his downswing. Bubba’s ball landed on the caper of the bunker, well short of the green, and rolled right back into his footprint in the sand! Realizing the predicament he was now in, Bubba took a huge swipe at his ball but couldn’t even advance it halfway up the hill. Without even letting it roll back down the hill, Bubba picked his ball up and conceded the match to Na, who would have had a 9-foot putt for birdie to win anyway. It appeared that Bryson DeChambeau was going to blink first in his opening round match against Russell Knox on Wednesday after hitting his tee shot on the 4th hole into some thick, naturalized area short of the green. But DeChambeau somehow found his ball, muscled it back onto the green and sunk a tough, curling 15-footer for par to halve the hole. With scrambling skills like that, it’s no wonder why he won the U.S. Amateur in 2015! Tiger Woods also made a miraculous up and down in his second round match against Brandt Snedeker. After airmailing his approach shot on the 10th into some bushes behind the green, he got on his knees, flipped his club over, and punched his ball back onto the putting surface using a left-handed stroke! The ball came to rest four feet from the cup and Woods sunk the putt to save par and halve the hole. 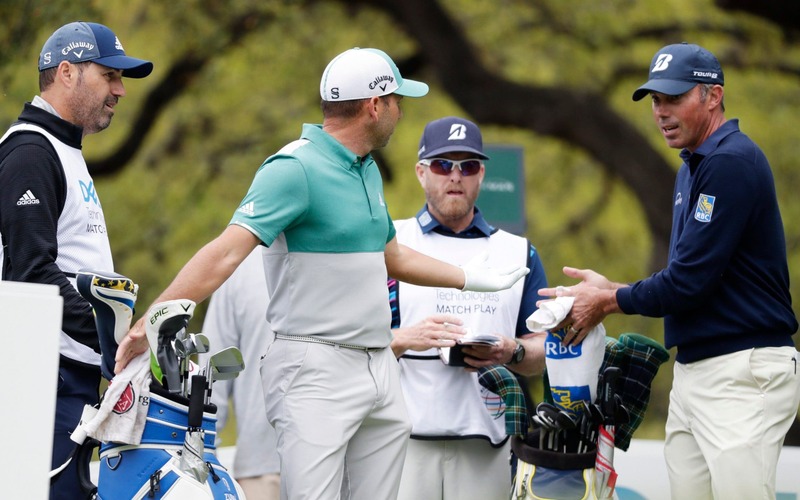 Sergio Garcia and Matt Kuchar were involved in a strange altercation on the 7th hole of their quarterfinal match at the WGC Match Play on Saturday. Down one at the time, Garcia had an opportunity to square the match by making a seven-foot par putt but the Spaniard didn’t hit his ball firmly enough and it just missed the left side of the cup. Garcia rushed to tap in his ball before Kuchar could concede it to him, yet somehow lipped out the 1-foot putt. The two convened with a rules official immediately afterward and it was determined that the tap-in counted because no verbal concession was given, even though Kuchar iterated that he would have conceded it if given the chance. Garcia then suggested that Kuchar should concede the next hole to make things right but the Floridian didn’t acquiesce, explaining to the media later that he didn’t think he should be responsible for rectifying his opponent’s error. The mood soured as a result. Garcia had an outburst on the following green after missing yet another short putt to halve the hole and then reportedly got into a heated argument with Kuchar and his caddie, John Wood, on the 10th hole. Around the PGA Tour, Kevin Na is known for two things: slow play and walking in his putts whenever he gets the opportunity. The latter made headlines during the Players Championship last month when he nearly caught his own ball before it reached the cup while walking in a birdie putt on the 17th hole. Tiger Woods was his playing partner at the time and responded to it by hilariously walking in his two-foot birdie putt just moments afterward. Hey, at least he gets a free drop out of the embedded lie for his second shot . . . could be worse!